There is a multitude of online shopping cart solutions powering large number of ecommerce sites. 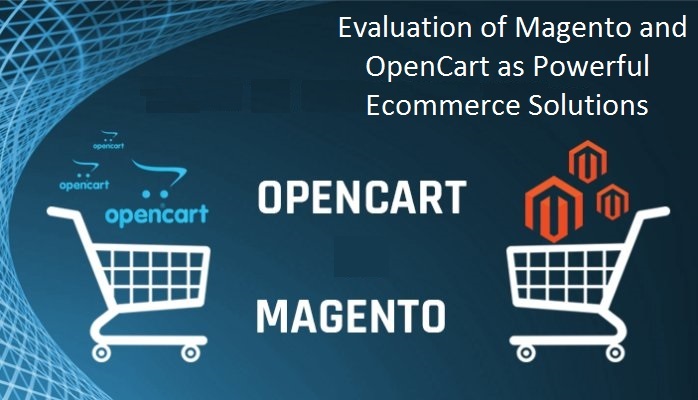 It is observed that Magento and OpenCart are two of the most extensively sought after online shopping carts that offer remarkable management of online businesses. Naturally, many online entrepreneurs face the dilemma of choosing between these two most compelling open cart software platforms. In order to make things simpler for you we are providing a simple and detailed comparison in terms of their important features such as customizability, target user, support, and price to name a few. Since OpenCart is open source application, you need not pay any licenses fee and can download it without paying anything. What’s more, you can even modify it for establishing your online presence by purchasing a web hosting plan. In case of Magento, users can explore three different options including Magento Enterprise Edition, Magento Community Edition, and Magento Go. These are created by keeping in mind varied needs of online businesses and have different price levels. Magento Enterprise edition is aimed at large enterprises and is available for monthly fee of $15550 as its license fee. If you are looking for an ecommerce hosted solution to manage small business, then Magento Go can be your choice at $15 for every month. For those businesses that need to operate their online business with help of open source application similar to Open Cart, Magento Community edition is the best fit. Needless to mention it is free to download. While there are many similarities as far as the targeted user base of both the shopping cart systems, they differ in terms of their scope. Depending on the hosting environment, OpenCart is aimed at online stores of all sizes and designers as well as developers. Magento covers all these categories and additionally provides a perfect ecommerce hosting solution for enterprises as well as businesses of large sizes. It is observed that small enterprises prefer to choose Magento to enjoy freedom from hassles of searching for a reliable hosting package. Community is vital aspect of open source software platforms and users can rely on vibrant communities of Magento as well as OpenCart. These have maintained large communities comprising of thousands of developers as well as fans. Both of these options are offering free tutorials, video tutorials, and free guides. Users can always bank on such resources made available by communities to get help in case of software related problems. Magento has a upper hand in terms of community support since provides training courses and facility of an expert consulting group to support users in development of custom modules and performance review. These groups are also useful for resolving common as well as advanced problems. You can always access an extensive directory of extensions made available by OpenCart and consisting of over 9000 modules in fee as well as paid categories. Instead of hunting elsewhere, you can find your desired quality template in the vast pool directory of OpenCart itself. Although fewer in numbers Magento does offer large number of customization resources in the form of modules and themes. In addition, users have option of purchasing the required themes or modules from an extensive collection of options from the web. Magento as well as OpenCart provide sound support of sales report generation, provide unlimited categories, and enable multi-store management. When it comes to comparison of features, it is found that many reviews and researches prefer Magento to OpenCart. Magento scores over OpenCart with around 150 additional features. Magento and OpenCart are ideal solutions for building online stores. If you are looking for a hosting solution to support medium to large store, then Magento needs to be considered.